From Erin: Great news!!! 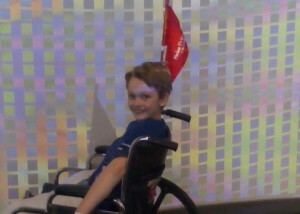 Jacob’s PET scan came back negative! You can’t imagine our relief. We also found out that he will start chemo on April 11th instead. He may or may not have to come back for P.T. after that. Praise God!!! Iron Man relaxing after a day of good news! This post currently has 18 comments. Jacob has made the move to Mary Free Bed. Today will be a quiet day – just meeting everyone here and learning what the routine will be for the next couple weeks. He will be heading back to Helen DeVos Hospital on April 18th to have his port put in and his first round of chemo. We’re still awaiting answers on his PET Scan. If that comes back clear, then we only have to worry about the cancer in his one vertebrae. Ken and Jacob have already found the air hockey table in the play room. Unfortunately Ken won, so we’ll have to work on that. 🙂 Jacob has his own wheelchair that he’ll use when he’s not in P.T. or O.T. 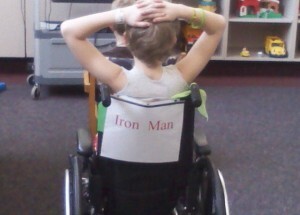 They usually put a sign on the back of the chair to identify who’s it is…..Jacob’s chair says “Iron Man”. Jacob now has to wait until Thursday to be moved to Mary Free Bed. They want to do some more testing on him because of a spot on his brain that showed up on one of the last tests they did. 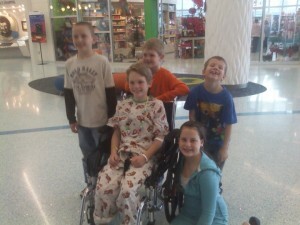 It is most likely nothing, but they want to be sure before he can leave to start physical therapy. They should get the results back from the bone marrow test tonight, but if you haven’t noticed yet, nothing is ever for certain when it concerns doctors, hospitals, or an illness like Jacob’s. Thank you everyone for your prayers. You have no idea what it means to all of us! For those of you who didn’t see Rachel’s (Jacob’s aunt) comment on the last post, the doctors have decided that Jacob wont be going home tomorrow as planned. Now they want him to stay and start physical therapy immediately so that he doesn’t stay confined to a wheelchair longer than he has to be. The plan is to move him to Mary Free Bed sometime tomorrow. Everyone is a little let down that Jacob wont be able to go home tomorrow, especially Ken, who had to make the long journey home today for work, and was hoping to bring his family with him. Today was a good day for Jacob and he was in high spirits! 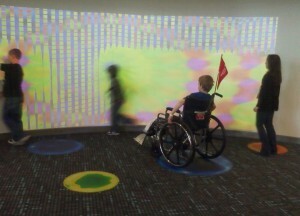 His cousins came for a visit and he was able to get out of his room to hang out in the lobby where they all enjoyed the motion-activated wall. He was even able to get out of his wheelchair and take a few steps! Everyone is very pleased with his progress and he has come a long way since his surgery the other day. 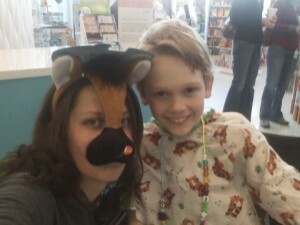 Jacob is doing fairly well today so far. He got the drain tube out of his back and hopefully that’ll relieve some discomfort. 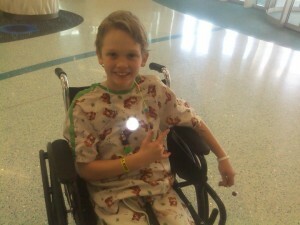 He will have another CT scan of his back this afternoon along with a bone scan. Please be praying that the Dr.’s don’t find anything else.